Latio, Latvia’s biggest real estate company reports that Riga property prices have now fallen in two successive months; the outlook for prices in the short-term does not look good. The latest of Latio’s excellent series of monthly reports on the Greater Riga property market shows a decline of 3.5% in the price of ‘standard’ apartments in the region, which follows on from a 1% decline in May. This is an abrupt turnaround from earlier in the year, which saw Riga posting a 44.23% rise in prices in the 12 months to Q1. Lativa has entered a tricky phase in terms of credit ratings (down in February), current account, cost of living (rising more sharply since the Spring), exchange rates and interest rates. The value of Latvia’s currency, the lats, is pegged to the euro but the Bank of Latvia has had to increase its interbank rate steeply this year and fluctuations in interest rates have been severe; the (6 month offered rate) level is currently 7.36%. Many UK homeowners will be delighted with the near-9% house price growth notched up over the past year, but their counterparts in the Latvian capital of Riga really have something to smile about: prices are up 39% from 12 months ago. 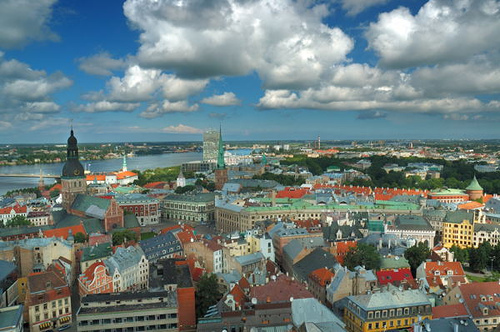 Riga topped a new global house price league table published by the estate agency Knight Frank. Its turbo-charged performance put it well ahead of Bulgaria and Denmark, second and third on the list with annual price growth of 19% and 17.8% respectively. By contrast, the biggest loser was Hong Kong; a year ago Hong Kong was boasting annual price growth of 20%, but prices fell by 2.6% over the 12 months to September 30. Only Germany managed a worse performance – prices there dropped by 3%. Liam Bailey, Knight Frank’s head of residential research, said: “Germany has been the poor man of Europe in housing terms for well over a decade, and any change in this position is still some way off.” Mr Bailey analysed the property markets in 32 countries. Japan, Portugal and Hungary also saw prices fall. It is a similar picture in Bulgaria, where the market has benefited from an influx of Britons buying second homes. All eyes have been on the US housing market lately, and the new data provides the latest evidence of a sharp slowdown, showing that the annual rate of growth has more than halved to 5.7%. Knight Frank also found that the appetite for second homes continues unabated, helped by the relentless march of the low-cost airlines. “Looking ahead, we are upbeat about prospects in 2007,” said Mr Bailey. Megan Malone doesn’t need to be told that flats in Latvia are rising in value faster than anywhere else in the world – because she owns one. The freelance educationalist, who lives near Brecon in mid-Wales, bought her 1920s two-bedroom apartment in the Latvian capital of Riga for just £35,000 in 2003. Now it has more than doubled in value. Few could doubt Megan’s shrewd purchasing skills at choosing a location that, at the time she bought, had scarcely been heard of by most in the UK. But she is not alone, as Britons increasingly become a nation of risk-taking property hunters. Today, literally millions of us own foreign homes while hundreds of thousands buy in highly unusual locations, driven by the desire to own a place in the sun and grab the maximum capital uplift when – with luck – it becomes a global hotspot. Bailey is the author of Knight Frank’s new Global House Price Index, which is due to be published tomorrow. The Sunday Telegraph has had an exclusive preview of the figures, and the good news for Megan Malone is that Bailey’s research – which looks at parts of countries where Britons are likely to buy property – has Latvia at the top of a 30-nation league table for capital appreciation. Intriguingly, 75 per cent of Arc’s buyers don’t even visit Latvia. They just buy there as an investment. The properties are used either as holiday homes, which are rented to tourists, or for long-term lets to locals. Other east European high fliers in Knight Frank’s league table include Bulgaria and Estonia, up 20Â·5 per cent and 12·9 per cent in the past year, while far-flung places like South Africa, Canada and New Zealand also do well with increases of 14·3 per cent, 11·8 per cent and 10·6 per cent respectively. All of this is music to the ears of Britons traversing the globe in search of bargains. There are no official figures held on foreign property ownership but there are some fascinating indicators. In Spain alone, Britons own 69,284 second homes, according to the Office of National Statistics (although as that figure includes only those declared to the Inland Revenue, there may be many more). The Department of Pensions says 871,000 Britons are retired and draw a state pension while living permanently overseas – and there are as many people again who have retired abroad who are either below pensionable age or choose not to take a pension at all. But Germany’s problem may well be that it’s just too close, too easy to get to, for us increasingly-adventurous property colonialists. Distance and time are not necessarily obstacles when it comes to a Briton bagging a bargain in the sun, it seems. A 12-hour flight from London to the Venezuelan tourist haven of Isla Margarita hasn’t deterred Carmel Daly-Fletcher, who runs The Skyrack pub next to Headingley cricket ground in Leeds. She and her husband, Paul, have remortgaged their home to buy three villas on Margarita, the cheapest of which is £61,000. So if a tiny island off South America is an attractive investment for Britons (and be honest, could you find Isla Margarita on a map? ), is anywhere out of bounds? This summer has seen the first holiday homes on Mauritius and buy-to-lets in Las Vegas go to Britons; this autumn there will be new schemes launched at Buenos Aires in Argentina and Gdansk in Poland, again with sales drives in this country. You have to go literally to the ends of the earth before you find a continent that remains a flight too far for the Brits: Australasia. Two New Zealand developments for sale over here – one at Wanaka and the other at Tui Creek, both on South Island – have so far struggled to find British buyers for properties priced at £400,000 and over. And two UK exhibitions of Australian investment properties had disappointing audiences, estate agents say. Retired businessman Stephen Parker-Swift isn’t content just to buy a home overseas – he’s building his own to get a dream property in what he reckons is a dream location. By mid-September he and his retired wife Diana will have completed their five-bedroom villa next to a golf course at Franschoek, about 40 minutes east of Cape Town and in the centre of South Africa’s glorious wine country. “We live in Salcombe in Devon, so the need to go away in the summer is limited. Why would we when it’s lovely at home? But we wanted a location which would be sunny over the British winter and would be a solid investment,” says Parker-Swift, who bought the plot four years ago but held off building to see the scale of development nearby as the golf course was built. The couple, who plan to use their new home for no more than three months a year, looked at different countries but plumped for South Africa. Despite its being almost 6,000 miles from Britain, they say the country is “only a bad night’s sleep away” and, with little time difference, there is no problem with jet lag.